Coming off of back-to-back wins, the Clippers hope to keep it rolling today. All of the players they acquired at the trade deadline have fit in well, and are helping them to a lot of wins. Landry Shamet is out there burying threes, while Ivica Zubac is a legitimate upgrade over Gortat. Garrett Temple and JaMychal Green have been effective in a reserve role, while Wilson Chandler is yet to make his debut. But the wins are there. Denver is 40-18 and looking like a team that could be on a collision course with Golden State in the west. Isaiah Thomas is starting to look comfortable, scoring 16 points in just 16 minutes of action in their game on Friday night. This is a team with talent all up and down, and injuries haven’t slowed them in the slightest. This is the fourth and final time they duel with LA, so perhaps having IT around is a new trick that can surprise them. Lou Williams is continuing to lead them in scoring off the bench with his 20 points (and five assists) per game. Danilo Gallinari is healthy again and impacting the game in the way they absolutely need him too. Montrezl Harrell, even with all of the new additions, is scoring his 16 points a night with seven rebounds. Allowing DeAndre Jordan to walk was the best decision the front office made in the offseason, to allow all the other guys the chance at serious minutes at the position. They are surprisingly just the 17th best scoring team in the league, but with all of the guys they have who can dump it in the hoop, that doesn’t slow them. Nikola Jokic is a pass-first big man who also has a beautiful stroke. Jamal Murray is instant offense out of the gate, while Gary Harris and Malik Beasley bury the three. When healthy, we cannot forget Paul Millsap either. EIGHT players score in double figures for this team. It’s no joke. Depth is crazy in here. This will be the fourth and final meeting between the two teams, and the first one that Tobias Harris is not here for. Denver took the win 107-98 on opening night, then got smoked by the Clippers 132-111 when they met in December. When they met last month, it was all Nuggets, as a strong first-quarter led them to a 121-100 win. Be sure to bet LAC +10! This matchup will be close, as both teams tend to play well and rise to the occasion on nights like this. 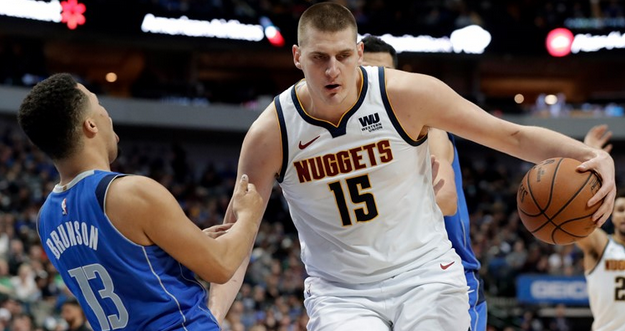 Nikola Jokic will have a major performance, while Lou Williams drops 35 off the bench. Six threes for Landry Shamet will help to keep LAC close. It’s going to be a battle from the opening tip, with both benches playing key roles.